Many manufacturers add water to their cooked meats to add weight. At Palmers, we cook in the traditional way. 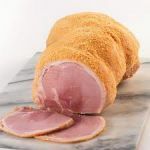 For example, our hams are slow cooked overnight for maximum flavour and tenderness. Our own made with either the addition of black pudding or spicy flavour.